Fiat Chrysler bossman Sergio Marchionne spoke a series of words at the Detroit Auto Show that suggested that not only is Ferrari definitely planning an SUV, it could come as soon as 2019, and it “has to drive like a Ferrari.” He also refers to it as an FUV, for “Ferrari Utility Vehicle,” and from this I think we can all extrapolate that it will be fast, deeply stupid, and make Ferrari a metric crapton of cash. ...which is a sort of fascinating statement because, let’s be clear here, “needs” and “Ferrari utility vehicle” are two words that really should have almost nothing to do with one another. 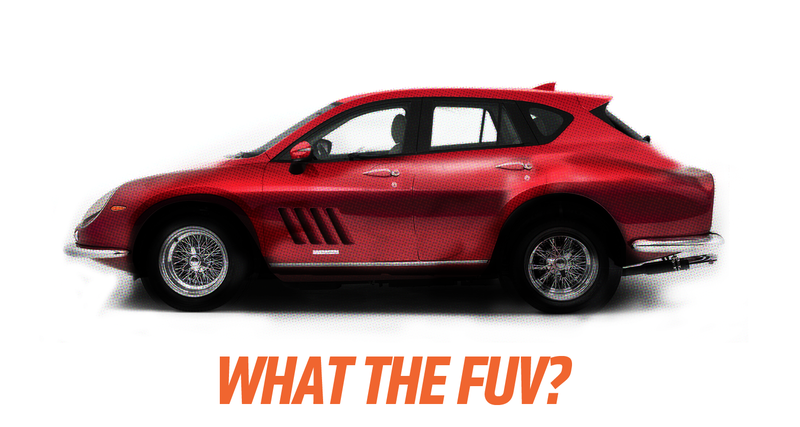 I’m pretty sure that when Marchionne says that the car has to “drive like a Ferrari,” all that really means, practically, is that is needs to be fast, ideally the fastest SUV made, because that is the sort of ridiculous, meaningless metric that will undoubtedly sell cars. For reference, the Alfa Stelvio Quadrifoglio will do 176 mph, and the new Lamborghini Urus is likely to be able to hit 189 mph. So, the new Ferrari will need to be faster than that, perhaps a true 200 mph SUV which, let’s be absolutely clear here, no one who buys one will ever drive that fast. So, it’ll drive like a Ferrari if you imagine, say, one of the front-engined Ferraris, like maybe the V12 FF, but jacked up a good six inches and riding on huge tires and with five to eight bags of peat moss strapped to the roof to move that center of gravity much, much higher. Also, let’s fill the rest of the car with more bags of peat moss to make it nice and heavy like a future Ferrari SUV will be. It’ll be fast, though. Fast like a Ferrari FF full of peat moss, on big tires, with more peat moss on the roof. While it’s easy to be cynical and see the move to SUVs as little more than a brand-whoring cash grab, it’s worth remembering that SUVs can be the cash cows that allow companies to continue to make their purer true sports cars even if they don’t sell that many. Ferrari is likely eyeing the growing Chinese market of “new wealthy buyers” which will be crucial if they’re to meet their stated goal of doubling profits by 2022. Pretty much every maker of high-end sportscars, luxury cars, and supercars is getting into the SUV business: Porsche was an early entry, then Lamborghini (well, post-LM002, I mean), now Alfa, Bentley, Rolls-Royce, and probably more to come. All of these things are fast, leather-slathered, absurd vehicles that will never go off-pavement or be tapped to a tenth of their potential, but that’s what people seem to want now. When Morgan announces their SUV, though, that’s when I’ll go bonkers. Unless it has three wheels. That I can live with.